$1,484.00 4-Boxes of Smith Creek Brand WSP Pond Dye Toss Packs 2-25 lb. Buckets of Smith Creek Clear Packs with Barley (8 oz. ea.) 4-5 packs every 2 weeks as maintenance 2-25 lb. Buckets of Smith Creek Muck Pellets (1 oz. each) 25 pellets every 2 weeks 4-25 lb. Beneficial Bacteria Booster Powder Optional: 4 Gallons of Cutrine Plus Algaecide where legal Double your applications where the pond is in need of extra help Double your applications to increase effectiveness in tough situations ! Take offs DIRECTIONS FOR USE: Use gloves when applying (included FREE). No measuring or mixing required. Toss the water soluble packets directly into pond. Apply one water soluble packet of concentrated dye per 1/3 acre of pond (per 290,000-580,000 gallons of water) to desired tint. Reapply product as needed. The water soluble packets will dissolve within minutes of coming into contact with the pond water. 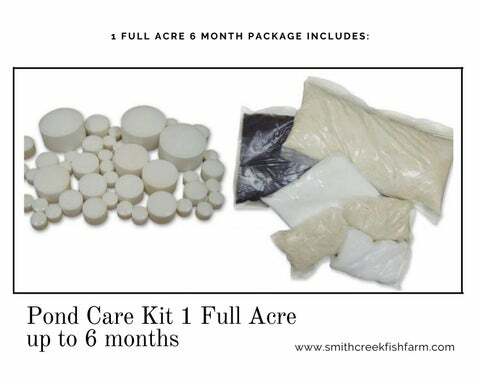 Reduce sludge buildup Eliminate pond odors Improve water clarity Reduce oxygen demand Eliminate excess nutrients Smith Creek Muck PelletsÂ are great for spot treating around docks, beaches or partially treating large ponds. This product is a pelleted formulation for targeting pond bottoms. While this bacteria blend is designed to treat several issues of water quality, these 1 oz sludge remover pellets are specifically designed to reduce sludge. 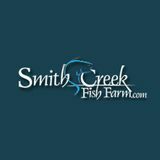 Smith Creek Fish Farm Small Ponds: 1 block per 1000 gallons every 1-2 weeks Large Pond: 12 to 20 blocks per 1/4 acre Apply every two weeks. Smith Creek Bacteria BoosterÂ raises the alkalinity of your pond water and provides useable carbon for bacteria. 25lb-50lb per Acre Foot=325,000 Gallons= 1/4 acre pond 4-6 feet deep Most ponds have low alkalinity due to acidic rain and normal pond biological processes. Smith Creek Bacteria Booster allows beneficial Â bacteria to work and thrive at their maximum rate. Here at Smith Creek Fish Farm, we invest a lot of money in bacteria products for our 39 ponds and indoor grow tanks, but we always use our bacteria booster to get the best value out of any bacteria product Simply mix with some pond water and evenly distribute around pond.